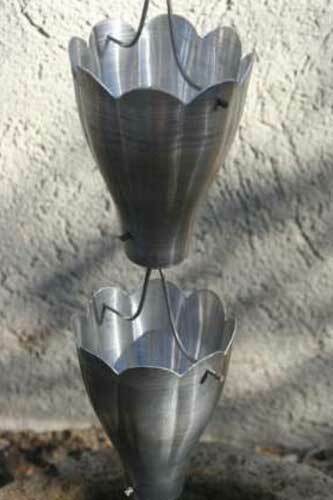 An aluminum version of our popular flared cup design. The sides are hand hammered for a beautiful effect. Lightweight and strong, this chain will last for many years. (Please note that aluminum does not age or acquire patina finish like copper does.) Also available in powder coated white, black or red. Powder coating will last on exterior products; paint will not. Powder coating is a type of coating which includes metal that is applied as a free-flowing, dry powder. The coating is typically applied electrostatically and is then cured under heat to allow it to flow and form a “skin”. It is usually used to create a hard finish that is tougher than conventional paint. Powder coating is mainly used for coating of metals. 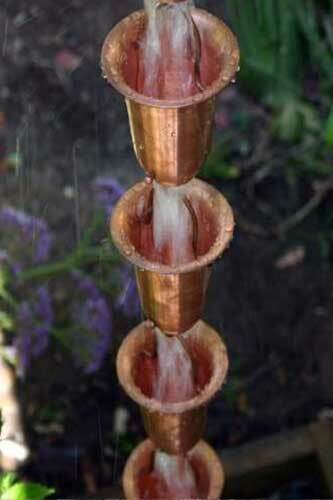 This is the LARGEST cup style rain chain on the market – each cup is over 4 inches across by 5 1/2 inches in length! For durability and strength, the connecting wires are made of stainless steel! This rainchain will handle heavy water flow conditions. Cups are made of pure aluminum. A functional conversation piece for your home! Our latest flower cup chain design is modeled after a real flower, the bluebell! It features beautiful, distinctive hand tooling in the sides of each cup. Hand crafted in pure copper, this chain will age beautifully over time. This unique chain of brass cups is an eye-catcher! Able to handle heavy rainflow, the brass is uncoated and will darken to a deep golden brown with age. 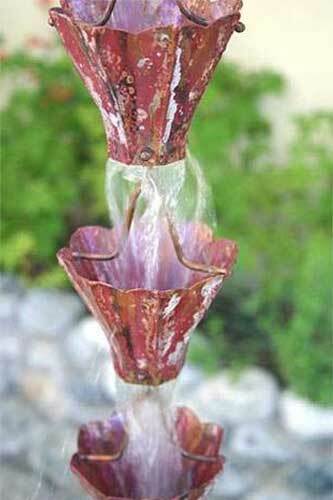 Handcrafted in California by artisan Steve, this unique, high- quality rain chain is visually stunning. 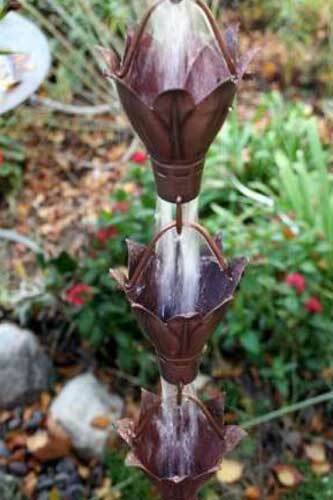 Comes in a 8 foot length (10 cups), made of thick, pure 16-oz. copper sheets. Folded at top and bottom for stiffness, this rain chain will age beautifully to a patina with exposure to the elements. Made in U.S.A. These exclusively designed, premier cups are breathtaking! The casting process gives us the ability to add so much more detail to the surface. Beautiful vein patterns decorate both outer and inner surfaces. Cast in pure brass, each piece is finished with a hand- applied patina finish, giving a gorgeous aged look. 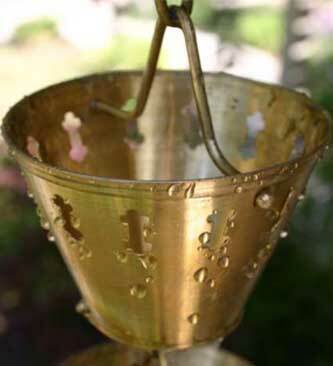 Each cup comes with an extra thick top and bottom loop (also in brass patina finish). They are easy to assemble with a pair of pliers, and you can buy exactly the number you need! 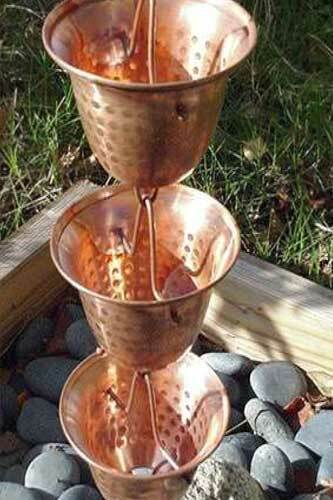 2 feet = 4 cups / 3 feet = 6 cups / 8 feet = 16 cups (this is closer to 8′ 6″) NOTE: Each cup weighs about a pound. Long drops may require gutter reinforcement. These exclusively designed, pure copper bell cups are breathtaking! 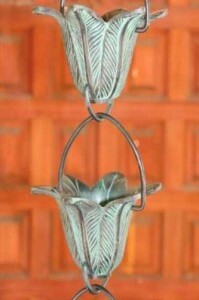 They feature a folded lip at the top (for stiffness) and hand hammered accents. 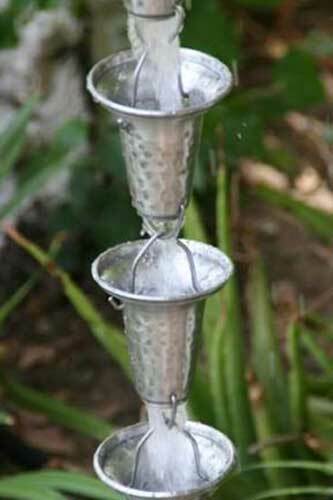 With a 1″ opening in the bottom of each cup, they will handle all waterflow conditions. 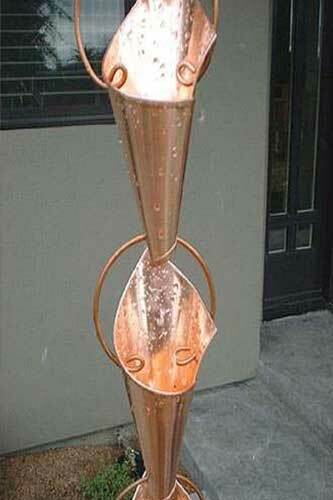 We have recently improved this simple design in pure, unfinished copper. The bottom hole is larger and the copper is thicker. 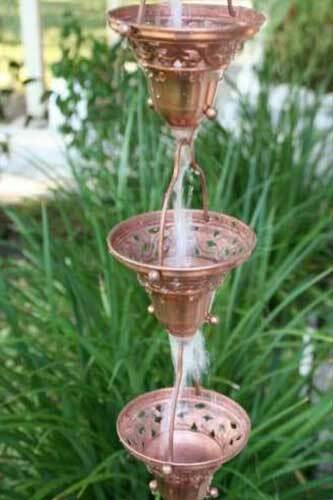 An Italian floral pattern is hand-tooled into the top of this beautifully crafted, pure copper cup rain chain. From the graceful arch of the wires that link the cups, to the perfectly round coppernuts that connect the cups together, the artistic styling is complete. Easy to assemble without tools. Like all of our chains, comes with a V-hook for easy installation.